“Sit down y’all…because I’ve got some stuff to say.”As a rather comfortable and energetic President Obama addressed the NAACP’s 106th National Convention, these words prefaced his long awaited and much anticipated remarks on the United States criminal justice system. As we know it today – and have known for some time- our criminal justice system is uniquely flawed in many ways. The United States, land of the free and home of the brave, boasts the world’s largest incarcerated population at 2.2 million individuals with a staggering disproportion of Blacks and Latino. Making up only 30 percent of the United States’ population, Blacks and Latinos make up 60 percent of the prison population. 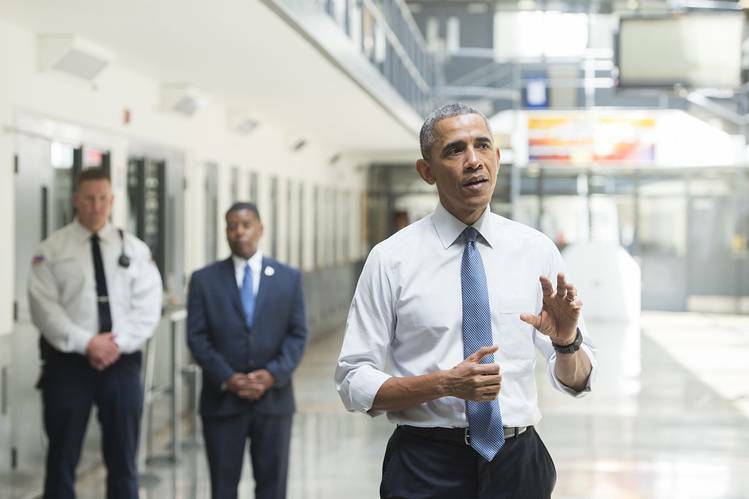 These were some of the statistics quoted by President Obama as he took a firm stance for prison reform. His reasons for suddenly using his platform for such a hotbed issue is somewhat unclear, but his thoughts around issues such as mandatory minimums, punishment for nonviolent offenders, felony disenfranchisement, and solitary confinement show that he has been thinking about these issues for some time. His confrontation of the inhumanity that exists in some prison facilities and the exorbitant amount of funding going into them was jaw dropping for some but there are a great number of us who have long been aware of the human rights’ violations that exist within our criminal justice system. We were simply waiting for the rest of the nation to catch on. The inequities that boys and men of color face in the United States are hardly a new phenomenon. Using passive terms like “the education gap”, “gang warfare”, or “single parent led households” only address symptoms of a larger issue. Unwillingness to openly discuss these inequities as a nation and the sheer oblivion towards these issues leave a gaping hole in our political framework. Enter BMOC field. Housing a unique blend of interrogations, the field combines the lived experiences of boys and men of color with research to create social commentaries that almost always translate into taking up some kind of social justice imperative. To challenge the current systems with a lens that is empathetic to the lived experiences of boys and men of color is a powerful tool. There is not a hint of paternalism nor an attempt to minimize the systemic contributors that create these disparities. BMOC thinkers are committed to facing the realities of institutionalized racism in a sobering way. With the nation’s ear now tuned to some of the intricacies of the criminal justice system, it appears that the time is fast approaching for the work being done in the Boys and Men of Color (BMOC) space to come front and center. As so many of the nation’s ills are directly tied to the oppression and criminalization of certain populations, this work opens a welcomed dialogue for those interested in suturing the moral fiber of the United States. Thought leaders in the BMOC space have created their own platforms, disseminated the information, and rallied around these issues but this new and narrowed focus draws more awareness to the work. As we think about the President’s address, let us consider the contributions that have already been made to this conversation. A Gathering of Leaders has been a safe space for many of these jarring conversations for what will now be four years strong. Thought leaders, social justice activists, researchers, and clinicians have come from all over to share their insight on the obvious and not so obvious elements of this broken system. This year’s Gathering will continue in this tradition, bringing fresh perspectives and alternative approaches to the criminal justice system and its penal codes. The cultural blind spots of public education, the misrepresentation of people of color in the eyes of authority figures, and philanthropic measures that try but miss the mark when it comes to disrupting the cycle of poverty and incarceration are integral to this scope of work and are a sample of some of the topics to be discussed at this year’s gathering. The scope of BMOC work is far reaching and begs to be expounded on. The systemic barriers that contribute to generations of poverty and incarceration is quickly becoming the most pressing issue of our nation and as we face the shortcomings of our beloved democracy, it is important for us to embrace the process of receiving knowledge. We may even find ourselves implicated in some areas of the system we thought ourselves far removed from. As hard as we try to avoid being a part of the problem, the truth is that the tentacles of this oppressive system are far reaching and oftentimes taken for granted as the norm. What can be gleaned from this is that our nation has collectively been nursed with the idea that the democratic society we live in is open to all citizens. Grappling with the reality that this is not true begins with a safe space to share ideas, encourage discussion and remain persistent. A Gathering of Leaders is one of those spaces dedicated to the expansion of BMOC work, building towards a more prosperous future for all impacted by the criminal justice system and other forms of oppression.